Grab a generous spoonful of German precision, add a dash of Canadian friendliness and you will get some of the finest tiny homes around. Just ask Maxwell, Ontario based building company Güte, who have perfected this formula to a T.
Güte, the company explains, is a German word that describes something that is good, high quality, or an asset. The family-owned company prides itself in achieving goodness through the harmonious combination of materials, meticulous construction methods, and beautifully crafted designs. 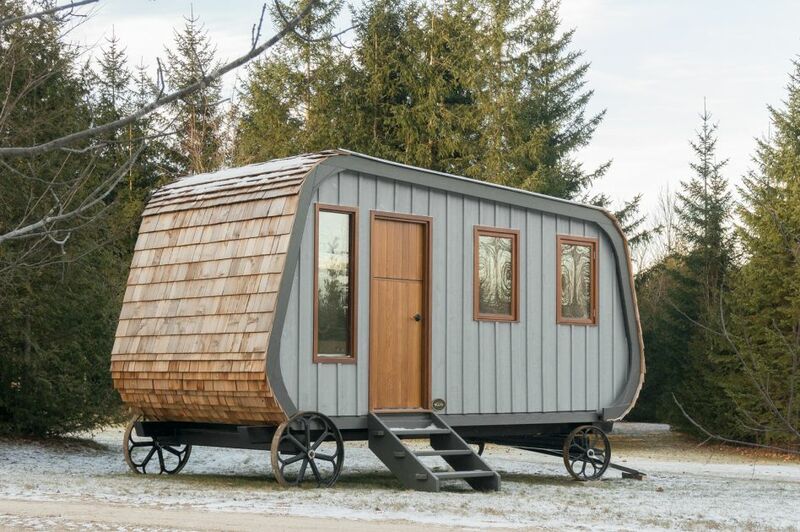 The Collingwood is just one of the tiny house models demonstrating Güte's dedication to practicing what they preach. A masterpiece of craftsmanship that is designed to be an addition to the everyday home, this prefabricated cottage is the perfect backyard getaway for Canadian tiny house enthusiasts. Let's take a closer look at the Collingwood, and its joyful ode to the simpler side of living. This elegant 17-by-7.5-foot (5.18-by-2.2-meter) Collingwood model has gray plywood panels, a galvanized metal roof, a cedar Dutch door, one fixed window, and three opening windows (one of which is hiding on the other side). The roof, siding, and exterior cladding can be customized according to color and material preferences. 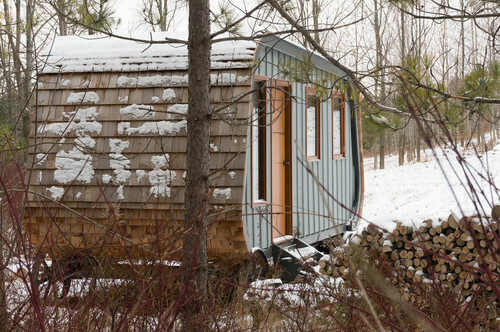 The stunning siding in this tiny home is made with Rustic Western red cedar shakes. These actually turn a silver gray color when left to naturally age, perfectly complementing the Collingwood's already polished vintage appearance. Cast iron wheels and pressure-treated steps invite the Collingwood's visitors to experience the finest details of this move-in ready home. 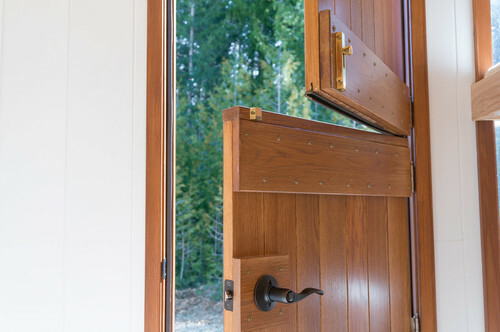 A delicate, traditional design Dutch door welcomes you into your own Canadian tiny house dream. 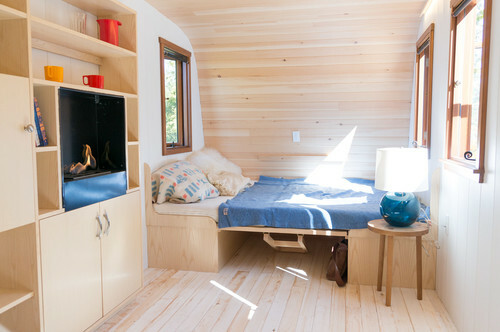 Everything you see here has been handpicked, milled, shaped and fastened by the conscientious German-Canadian tiny home building company. The Güte team take a lot of pride in their woodwork, adding a coat of moisture resistant paint and two coats of clear exterior finish to everything they have created from scratch. This enhances the polished finish that we see, and also protects the wooden doors and windows during the roughest Canadian winters. Hardwood flooring and solid wood interiors help sustain the classic cabin motif. 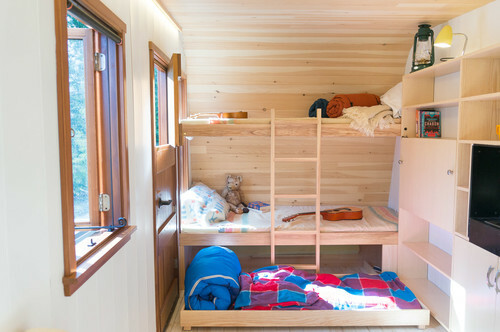 A bunk bed is cleverly stowed away right by the entrance. Bedding is aplenty in the Collingwood, which puts rest and relaxation at the forefront of its cozy interiors. So much so, that you can find bedding in the most unexpected corners. 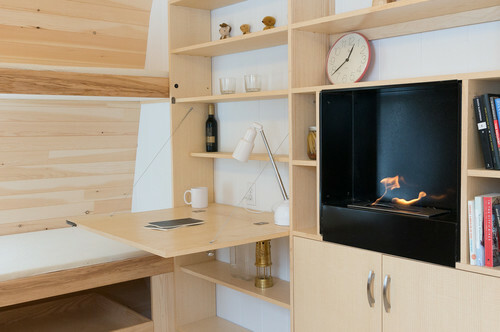 Practicality is a given in this tiny escape, which includes a booth-style table which can be converted into a double bed. Just like that. Pretty neat, huh? Warmth and comfort at the Collingwood are enhanced by insulated walls, thermal pane windows, and an ethanol fireplace. Library shelving and a fold-out desk turn the Collingwood into the ideal work station for those wanting a quieter place to get productive. Because it is intended to be a compact guest cabin or personal office space, the Collingwood lacks its own bathroom and kitchen. It may not be a fully livable home, but this tiny house enables its owners to retreat to their own happy place regardless of these omissions. Güte's Collingwood is your own tiny sanctuary, a place for peace and quiet not too far away from home. 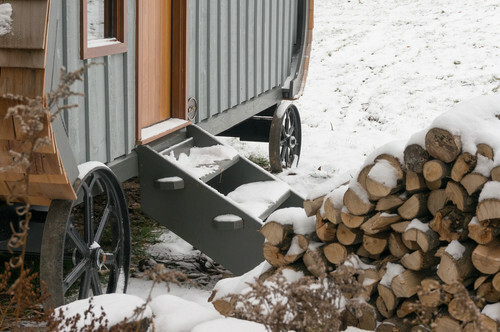 With such a brilliant blend between German workmanship and Canadian innovation, anyone who stays in a Collingwood cabin is set to get a personalized taste of the wholesome elements that come with tiny living. 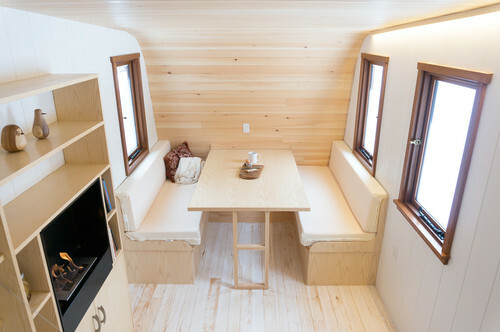 Very bravely painted white, considering its life on the road, this tiny home on wheels is a castle compared to some. It's big and beautiful. 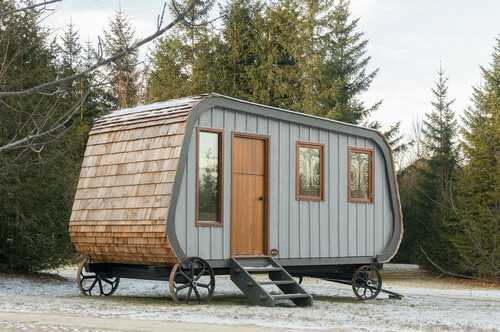 If you've been pondering the idea of downsizing to a tiny home, these photos of a luxury domicile by Tiny Heirloom may shift your decision into the must-do column.